The book I want to tell you about today focuses on “connecting to nature while savoring good food.” It’s about seasonal, fresh food whether foraged in the wild or at the best local-sourcing market. And, the recipes are simple, straightforward dishes made with those beautiful ingredients. Can you already tell I really liked this book? It’s Savor: Rustic Recipes Inspired by Forest, Field, and Farm by Ilona Oppenheim, and I received a review copy. Oppenheim lives in the mountains in Aspen, and much of what she cooks does come from foraging in the woods near her home. Many of the ingredients are used in a couple of ways including a fresh dish to make right away and another one with a preserved version of the ingredient to use later. There are lovely chapter titles that correspond to where the primary ingredients are gathered like Around the Pasture, Into the Wild, and Through the Mill. There are wonderfully simple building blocks to use in other recipes like homemade yogurt, ricotta, and cultured butter. There are two versions of savory, rustic tarts, and they’re both so pretty in the photos. One is made with thinly sliced zucchini, goat cheese, lemon, and rosemary, and the other is filled with halved cherry tomatoes, onion, and thyme. Trout is shown three different ways with a Trout Amandine, Cured Trout, and Trout Jerky. I wish I had a stream full of trout nearby where I could catch the freshest fish, but fresh from the store will be the best I can get. There’s information about soaking grains and how that makes nutrients more available and digestible, and it was good to learn that dried, soaked grains can be stored in the refrigerator for up to six months. I’d love to have some soaked grains at the ready for the cookies and breads. I’d also like to try the Ancient Grain Pancakes made with buttermilk-soaked grains. Throughout the book, there are dishes both savory and sweet for every meal as well as snacks. I wanted to make good use of some of the last root vegetables of the season, and oven-crisped chips sounded like a perfect plan. The process couldn’t be simpler, but it requires a little patience for the chips to dry enough to be crispy. A big sweet potato and some beets were scrubbed but not peeled. They were all thinly sliced on a Benriner. The sweet potato slices were kept separate from the beet slices so the color couldn’t bleed. Although, I used chioggia beets, and they tend to bleed less than red beets. Each group of slices was tossed with just a teaspoon and a half of olive oil and salt. 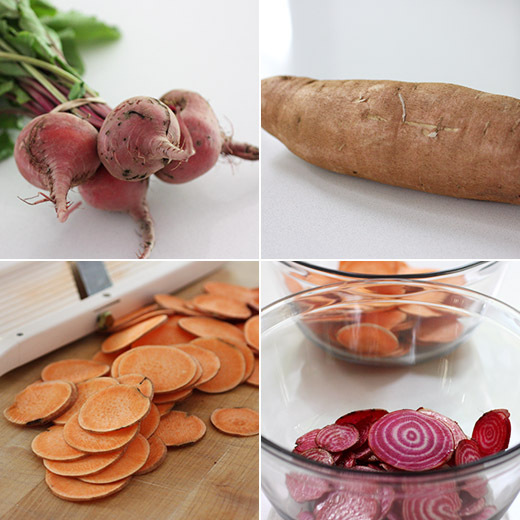 The sliced vegetables were placed on separate baking sheets and baked at 250 degrees F for an hour and forty minutes for the sweet potatoes and two hours for the beets. The pans were rotated a couple of times during baking. You’ll want to check the chips from time to time toward the end of the baking time to see if they’re getting too brown or if they’re still tender. After baking and cooling, the chips can be stored in an air-tight container for a few days, and they stay crisp. I served the chips with whipped feta and an extra sprinkling of flaky sea salt. Each vegetable’s earthy sweetness gets concentrated as it slowly bakes. 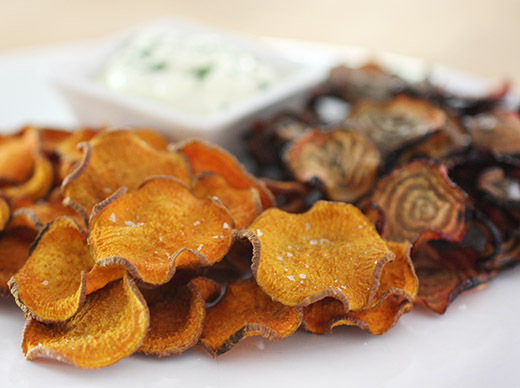 The crunchy chips make a great snack on their own or with a dip, and whipped feta was especially good with the beet chips. I may be doing my foraging at farmers’ markets and farm stands rather than in the great outdoors, but I look forward to using my finds in the simple, delicious dishes from this book. beets are just one food that i haven't yet learned to like. i will say that they are most beautiful, especially sliced and baked like this! Love the homemade veggie chips, esp. 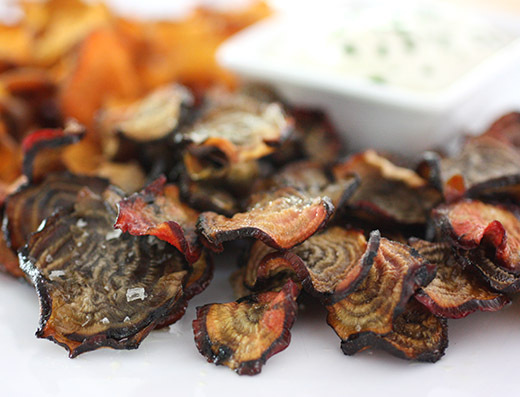 the beet chips. Sounds like a terrific book! And you've just reminded me I need to check on the beets in my garden and see if any are ready. Probably just a little early, but I better make sure! you did a fantastic job, they look amazingly crisp, definitely worth the energy you put into making them! Lisa, it seems so simple, yet it's always nice to be reminded that seasonal, fresh ingredients need not be complex! This is an awesome snack! The book sounds like a winner...love root chips, but confess I've never made them! Yours are so much healthier than anything packaged. I think I'm getting lazier as I age. :) You always inspire me. The simplicity of flavors in your chips is enough to make me want to make them! Hi Lisa, each chip looks perfectly roasted, I bet these are delicious and do not have as much salt as the packaged kind either. Such a great alternative to fried food. Thanks for sharing!